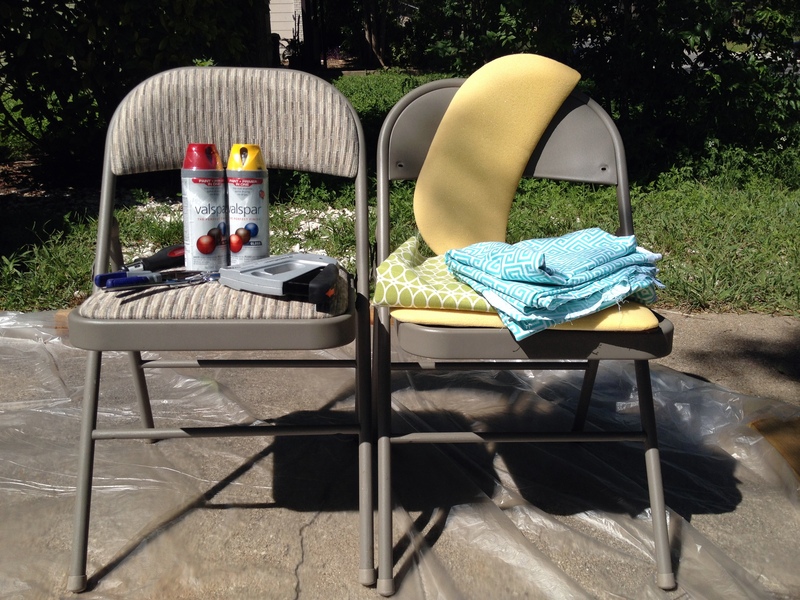 A while back, I saw these painted folding chairs on Pinterest and knew I had to give it a try. I already had four folding chairs from Costco, I’m pretty sure I got them for $15 each. I bought some green fabric from Joann’s and had leftover blue fabric that previously served as no-sew pillow covers. (In case you were curious, here are the steps for the pillow cases). Lowe’s only had Valspar spray paint which I knew wasn’t the best, but I was too lazy to go elsewhere. Here’s the photo-documentation of the steps. First was the very annoying removal of the old fabric and staples. I unscrewed the padded seating and used a flathead screwdriver combined with some pliers to pull out a million staples for a couple hours. The Costco chairs had a flimsy plastic backing for the back rest and thin particle wood/cardboard backing for the chair seat. I was a little worried that I wouldn’t be able to re-staple using the same backing, but it turned out fine. Here’s the before pic with the chairs and naked padding. Next was the actual spray-painting of the chairs. 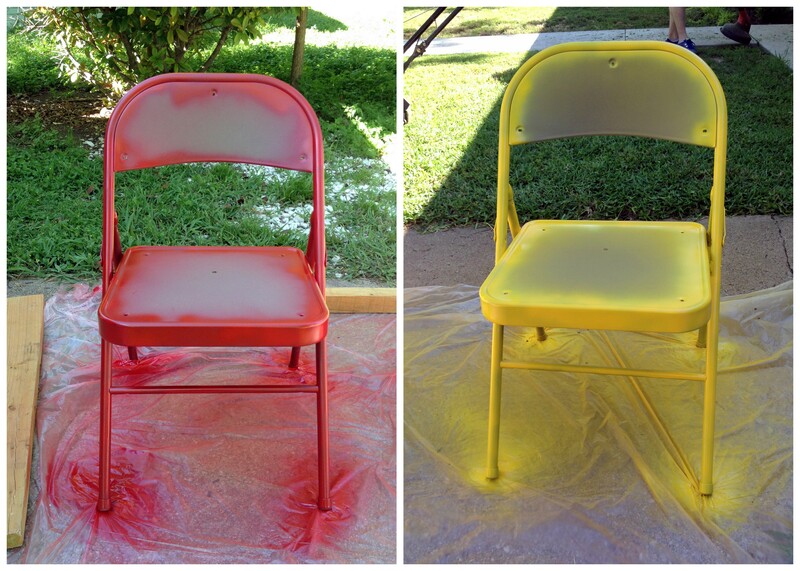 I wiped down the chairs and used Valspar spray paint in red and yellow. The red turned out nicely and only needed one coat. The yellow was not as successful. It didn’t cover well and came out an ugly yellow green. I ended up repainting it in a lighter yellow using Home Depot’s spray paint, but it chips easily. I highly recommend using darker colors or trying Krylon spray paint as Carrie Loves suggests. 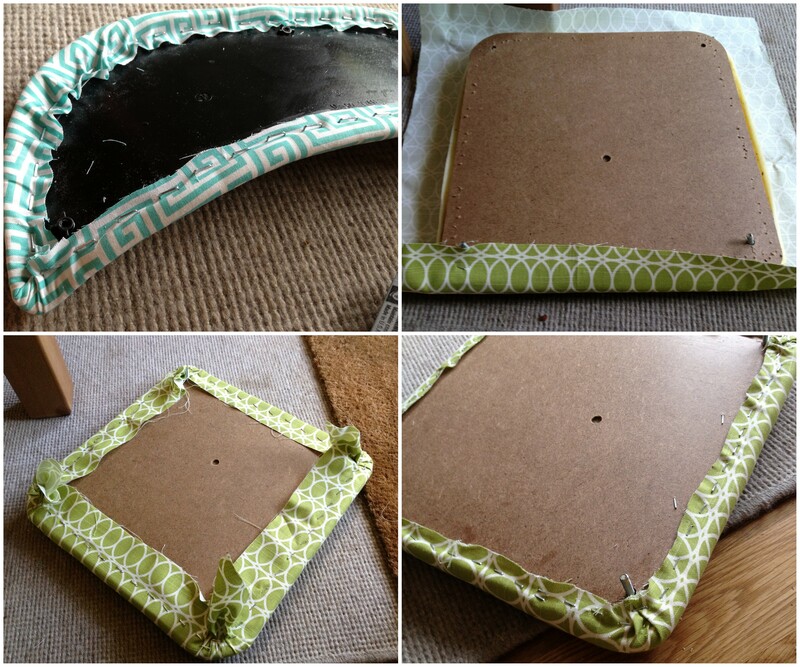 Then came the muscle-enhancing stapling of the new fabric over the old cushions. Cut the fabric to fit the padding with 3-4 inches to spare on each side. After stapling, trim off the excess fabric. Some of the staples seemed to poke through when leaning against the back padding so I hammered down the tips. Lastly, screw the seats back onto the chairs. 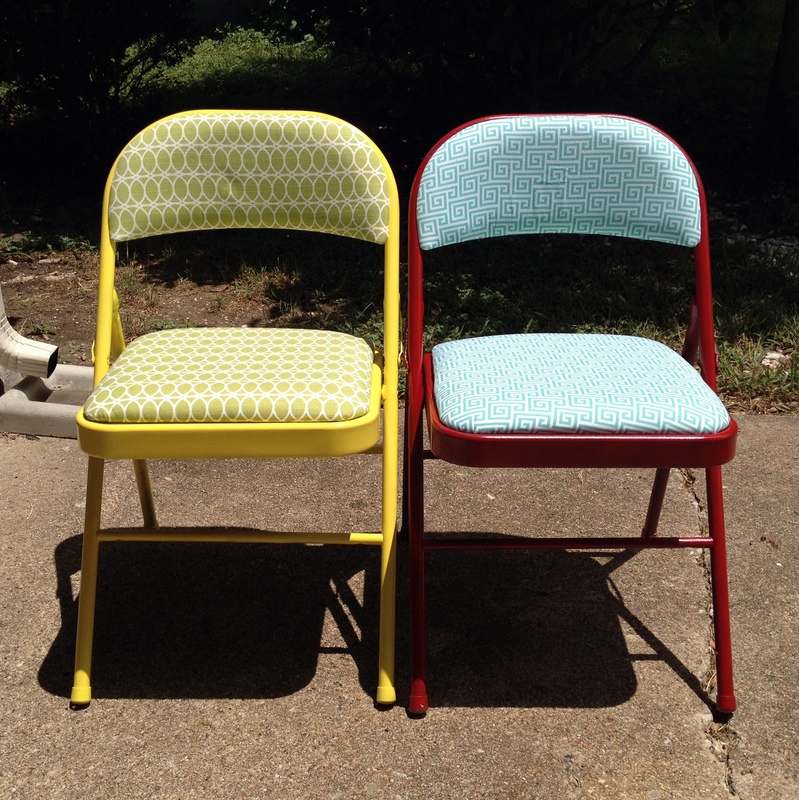 This project took place over a couple weekends, much longer than I had planned, but the chairs look a lot more fun now. They’re ready for the next party! 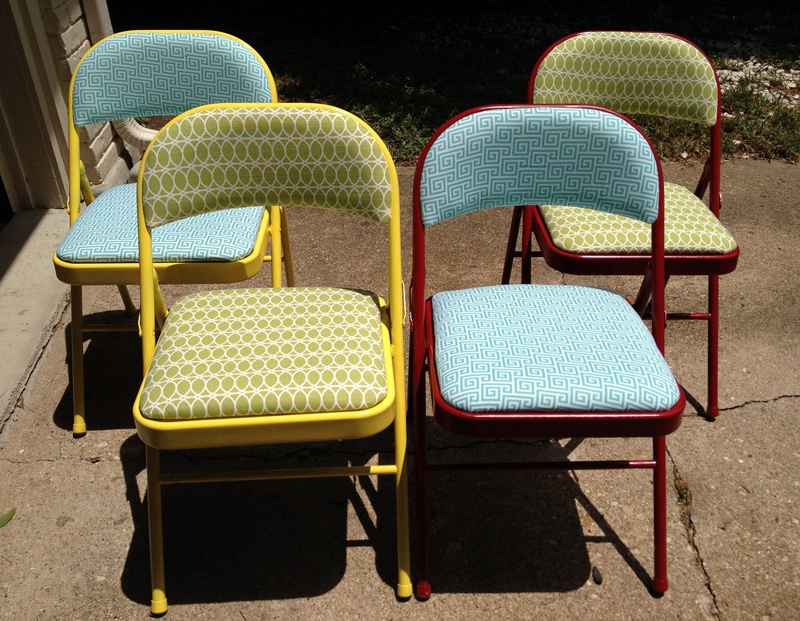 This entry was posted in Crafts and tagged painted folding chairs, reupholstering folding chairs. Bookmark the permalink.